A recent Economic Impact Study conducted by Dr. Greg George, Associate Professor of Economics and Director of the Center for Economic Analysis at Middle Georgia State University report states that since 1991, Houston County Habitat for Humanity made an economic impact of $7,257,963, most of which was concentrated in Houston County. 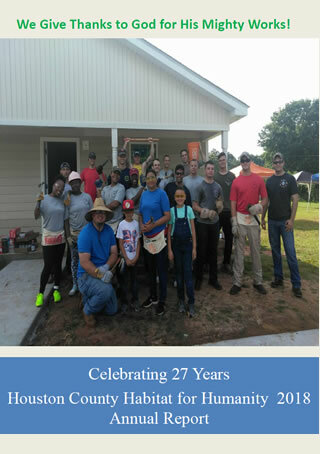 Total earnings in the area rose by an estimated $3,563,052 and a total of 76 jobs were created consequence of Houston County Habitat for Humanity's contribution to the local economy. Broaden the base of Habitat's financial support.